One of the big benefits of signing up for the Income-Based Repayment (IBR) plan, Income Contingent Repayment (ICR) plan or Pay As You Earn repayment plan for your student loans is that you can have any remaining balance forgiven after 25 years for the IBR and ICR plans or 20 years for the Pay As You Earn plan. Personally, I have been on the IBR plan for a few years now primarily due to the fact that I owe such a large amount in student loans that the standard monthly payment amount is well over $1,000 per month. Obviously, this is not exactly an affordable monthly payment for me, hence my enrollment in the IBR plan. 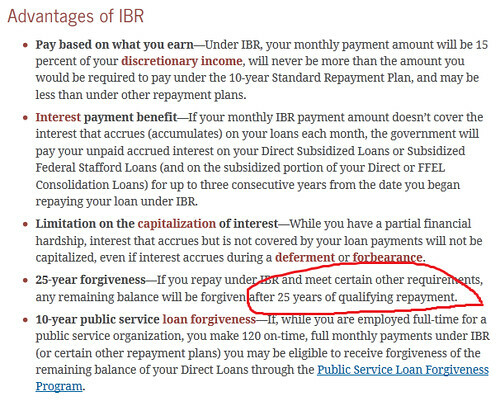 The IBR payment plan FAQ from the site does not offer any further clarification on what is considered a “qualifying repayment.” For me, I was concerned about having an IBR requirement payment of $0.00 and if that qualifies and counts towards the 25 years of qualifying payments. So, I contacted the Federal Student Aid Information Center to find out. Does A Requirement Payment of $0 Count Towards Loan Forgiveness Payment Periods? After sending an email to the Federal Student Aid Information Center, it took only a couple of days for me to get a response. Below, you will find their response in full. Thank you for your inquiry about federal student aid. Under the Public Service Loan Forgiveness (PSLF) Program, the outstanding balance of a William D. Ford Federal Direct Loan (Direct Loan) account can be forgiven after the borrower has made 120 monthly payments while employed full-time by a public service organization or serving in a full-time AmeriCorps or Peace Corps position. You can access more information about the PSLF Program at StudentAid.gov/publicservice. Any month when your scheduled monthly payment under the Income-Based Repayment (IBR), Pay As You Earn or Income-Contingent Repayment (ICR) Plan is $0 will count toward the 120 monthly payments required for the PSLF Program if you are also employed full-time by a qualifying public service organization during that month. If you have additional questions, you should contact FedLoan Servicing–our PSLF Program loan servicer. You may call FedLoan Servicing at 1-855-265-4038 or e-mail the servicer by clicking on “Contact Us” at the FedLoan Servicing website at www.myfedloan.org. While they responded referencing the Public Service Loan Forgiveness program, I think that it is safe to say that the same qualifying payment standard applies to the IBR, ICR and Pay As You Earn programs. That means that the answer is – YES!!! If your scheduled payment is $0.00, then it DOES count towards your 20 or 25 years of qualifying repayments. ← What’s The Difference Between Income Based And Income Contingent Repayment? A. “While on IDR, you can still postpone payments temporarily with a deferment or forbearance. Sign in to Account Access to take the Eligibility Quiz to determine what you qualify for. “NOTE: The periods of time while you are on deferment or forbearance (with the exception of Economic Hardship Deferment) will not count towards your qualifying payments for forgiveness. So, if you are making $0 payments under “Economic Hardship Deferment” then this is counted as a ‘qualifying payment’ toward forgiveness.